Located in Dargavel Village, Bishopton is this fantastic 3 bed semi-detached villa. The home has a welcoming entrance which leads to the bright lounge and sun soaked kitchen diner which has been upgraded to include integrated appliances. The ground floor also benefits from utility room and w.c. 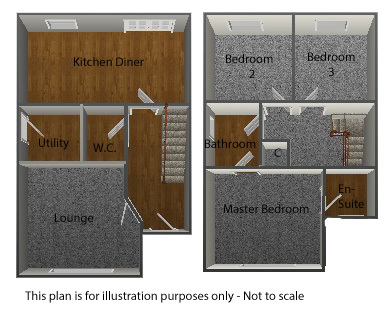 The upper floor has 3 bedrooms, the mastering having en-suite, and family bathroom. The rear garden is south facing and is an excellent spot for entertaining. Upgrades to the home include coving to ground floor ceilings, integrated appliances, venetian blinds and glazed doors to lounge and kitchen. Dargavel Village is set adjacent to the popular commuter village of Bishopton, which has plenty to offer with convenience stores, post office, pharmacy and so much more. The family will not be short of activities within the village and surrounding areas. Perfect for the commuter as it is within walking distance of Bishopton Train station which operates an excellent service. The M8 network which links the village to Glasgow and beyond is close by. You can now arrange your viewings 24 hours a day directly through New Door's website and clicking on your preferred time. We will then confirm the timeslot with you.